Kasautii Zindagii Kay : Anurag And Prerna In This Latest Capture Is Royalty Personified! 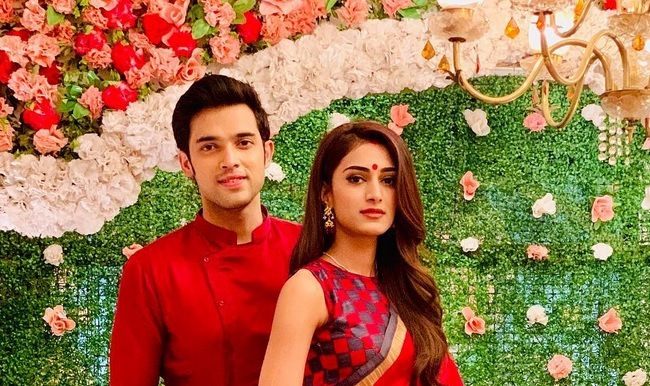 As reported earlier, Star Plus’ Kasautii Zindagii Kay is heading for a major turn in the story and what the audience would be getting to witness ahead is a clash of two young ladies that have apparently turned Anurag Basu’s life upside down. As show in the promos, Anurag maybe still going on with the bad boy phenomenon with Prerna but Prerna would retaliate and poor Anurag will have to face the wrath of his own strategy. Also Read : Forget Being A ‘Bechari’, Prerna Is The Rebellious ‘Nari’ In The Latest Kasautii Zindagii Kay Promo! Anurag and Prerna’s love story might take a completely different turn for all we know but it won’t be definitely easy getting the couple to pose in a single frame, flashing those charming smiles. Well need not to be disappointed, for this click of the duo right here will make your staring all worth while. The absolutely stunning picture of Erica Fernandes and Parth Samthan as Anurag and Prerna looks nothing less than royalty personified and surely gives an insight into the beautiful view that’s going to come on screen. And thats the original pic! Hina Khan : With Her Bengali Bride Look There's No Way She Cannot Make Your Head Turn! I can’t believe Prerna was so dumb to get pregnant even after seeing Shivani!!!! Also how the hell do you even get in the mood while being chased by goons? ?